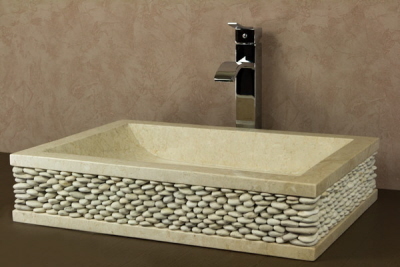 Square Blanco Cream is a graceful combination of two natural materials, marble and pebbles. All together looks very light and elegant. Because of this specific shape, this model is available in only one size – 45x55x13cm. But you can easily choose color you desire – we produce this model mostly from marble cream. Every sink comes directly from Indonesia and its made by our best craftsmen. It’s worth to notice that it take long hours to cut, drain and even to form the stone to the right shape. Because of the manual polishing it is extremely smooth and shining. This kind of washbasin especially fit to luxury bathrooms in a hotel or SPA center, but with a good taste you can use this model anywhere you want. It’s important that our product are created from one piece of stone always. Thanks to that we never use putty, paint or even glue and we provide the best quality you can get on the market. Because we are international company we give you the possibility of choose the drain hole. They are available in any size, like European, US, AUS or Asia.